Here is a picture of the T3 Terminator brakes. Beside them is 338 Norma Mag, 338 Edge, 7mmRum, 338 Lapua improved & 338 Lapua. I have tested this brake extensively against many others & it clearly comes out on top, firing well over 200 rounds in the process, mainly in 338 Lapua. This brake works exceptionally well with these & similar sized cartridges with 80-110+ grains of powder capacity. I still have to complete testing on these other brakes to ensure I get as much recoil reduction from them as possible. Being a rearward ported brake they disturb the ground directly infront of the shooter a lot less than other types of brakes. This pushs the array of debris disturbed from the muzzle blast away from the shooter, scope & action, while shooting from the prone position. 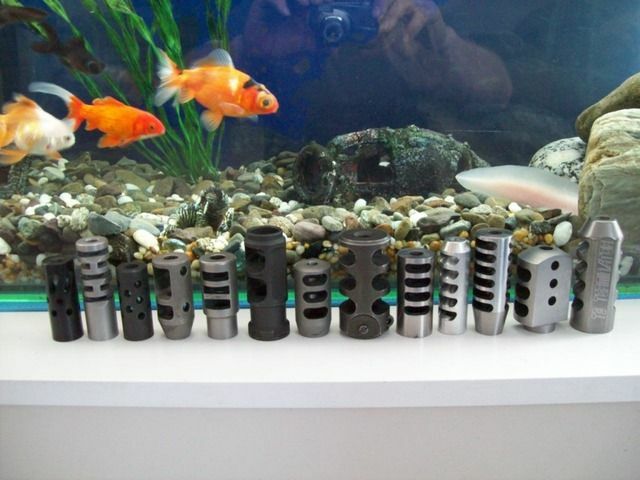 These are CNC machined from 420 or 316 stainless steel & are avaliable with various thread sizes from 9/16 to 20mm. As you can see from previous videos they reduce recoil extremely efficiently making the current trend toward lighter & lighter rifles very comfortable to shoot. More pictures to follow when I have them fitted to a couple of rifles, Cheers. Last edited by Kiwi Greg; 02-02-2012 at 01:03 PM. Nice looking bits of kit Greg. Can they be fitted to existing suppressor threads ? Yep no worries, depending on the size, I can make to order but that will take a bit of time or $$$. The thread can be made bigger by a competent gunsmith. I do have various threads on the big ones aready made. The smaller ones will have two standard threads so will be able to be opened up. Contemplating a dedicated LR rifle - either 7mm mag or 300wsm I'm thinking.... one of these would be the business on it! You will probably be better off with the smaller ones I have yet to finalise, time will tell. They are becoming legendary here. I have put one of Greg's T3 Brakes on my new Sendaro 300 - works amazingly well. 1st muzzle brake that i have had - very impressed - able to see bullet strike on a wallaby on the weekend at 347 metres with 190 bergers. Spanners, 7mmsaum and cambo like this. Here is a line up of muzzle brakes I have tested with 338 Lapua magnum. 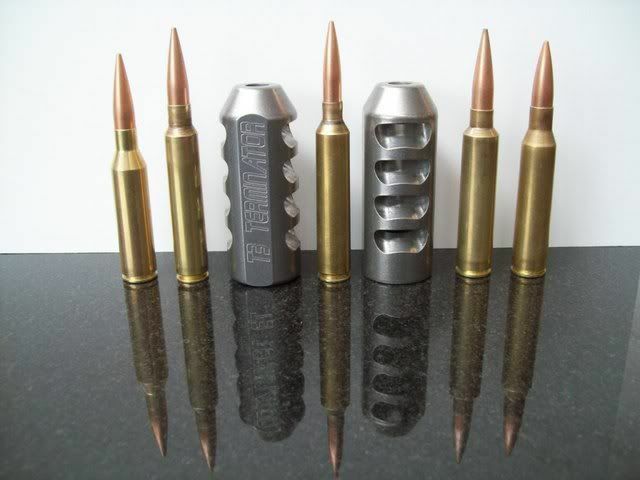 From left to right least to most effective in reducing recoil. The two on the far left are in a dead heat for that position. The T2 did remarkably well, so will still be very acceptable on the bigger magnums with thin barrels, Rem LSS/SPSS in Rum etc. Thats if the T3 is not your cup of tea on a thin barrel. Can I have one of the orange "bio" ones in the background? How much? I had a go with gregs 7mm mag down the range yesterday with his 7mm brakes which I think he is in the final stages of perfecting and it certainly made the sps rem mag a walk in the park when we screwed the brake on. One of these will certainly be on my shopping list shortly for my 7 pound all up 280 AI. What methodology/equipment did you use to objectively test your muzzle brakes against the other brands tested? I have fired several rounds through each of them, most of them on many occasions over the last year or so & recorded their average recoil movement in relation to each other. There is a small difference between some of the measurements, but it takes little movement for your shoulder to be able to notice. I can tell you from my testing that seemingly subtle changes to the brake can make a big impact to how efficently they work. Having fired over 250 rounds of 338 Lapua magnum & plenty of 338 Imp, 338 Edge, 7mm Rum, 7mmRm, 308 & 708, you can understand the cost in ammo & time is considerable, let alone wear & tear on barrels. I may do some suppressor comparisons, but initial tests have shown they reduce recoil less than a muzzle brake.